The women's restroom has four private bathroom stalls with cathedral arched lockable doors. 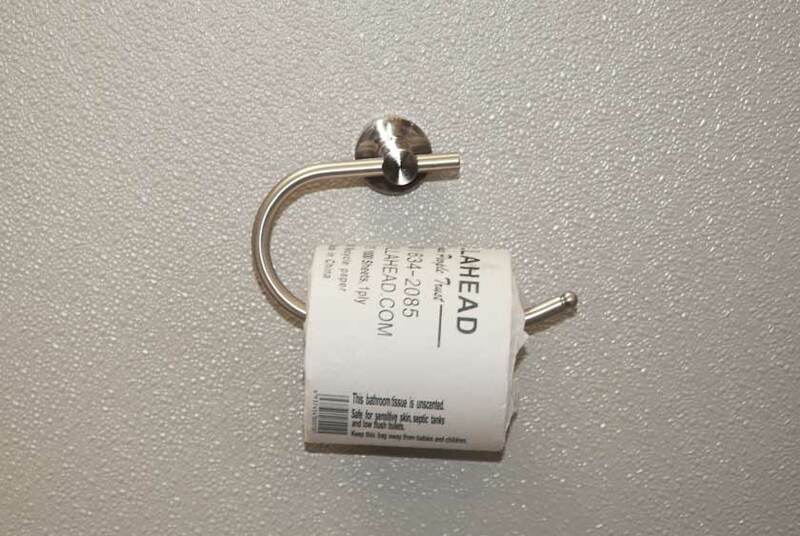 Each large bathroom stall has a porcelain flush toilet, brushed nickel toilet paper dispenser, and trash receptacle. The porcelain toilet bowl has a convenient pedal flush for hands-free operation. 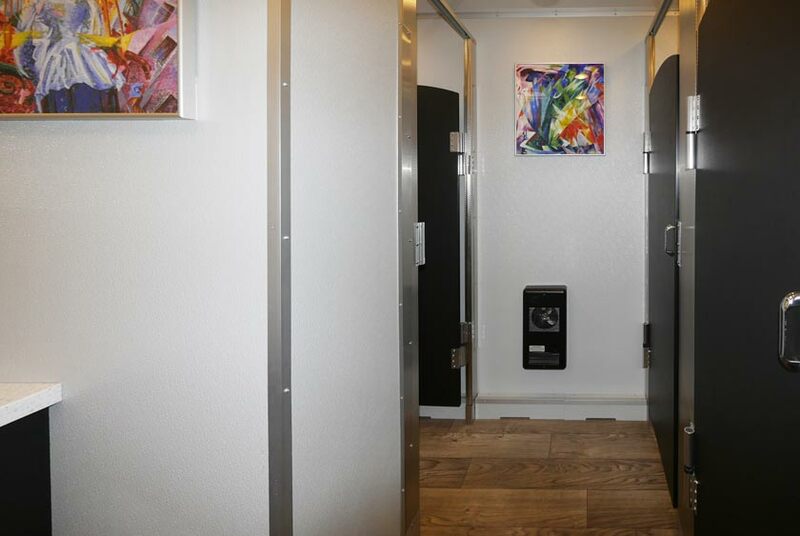 There is framed artwork in each stall to deliver homelike restroom comfort. The men's restroom is classily decorated just as the women's and includes all the elaborate amenities. 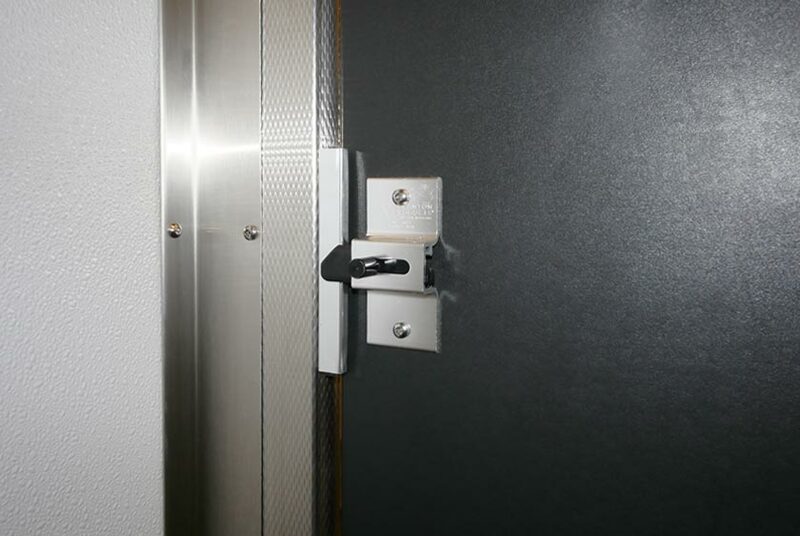 The men have one private bathroom with all the comforts contained within the women's stalls. 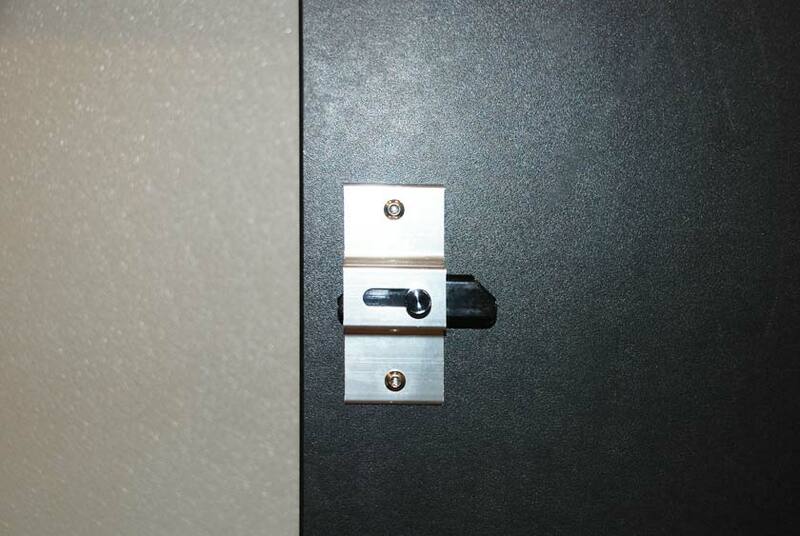 Additionally, the men's restroom includes four Sloan porcelain waterless urinals with black privacy dividers. 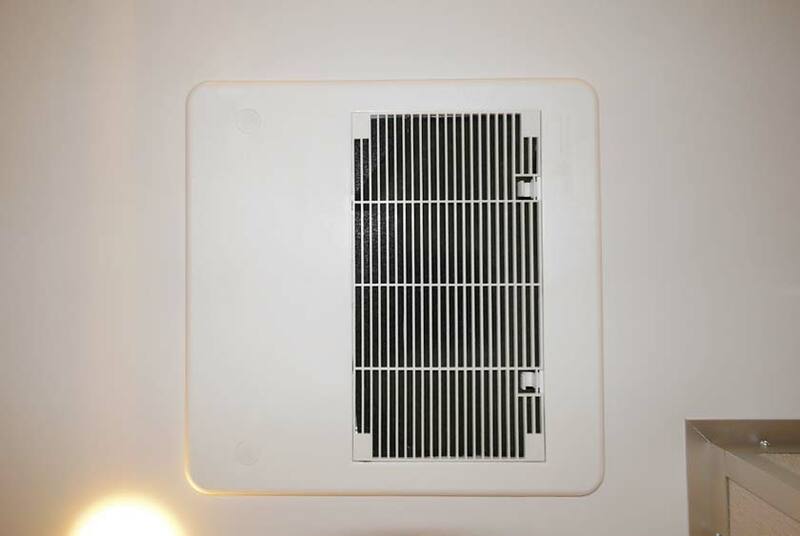 The waterless urinals have a special filter system to ensure odor-free operation. There is a large shelf above the urinals for convenience. 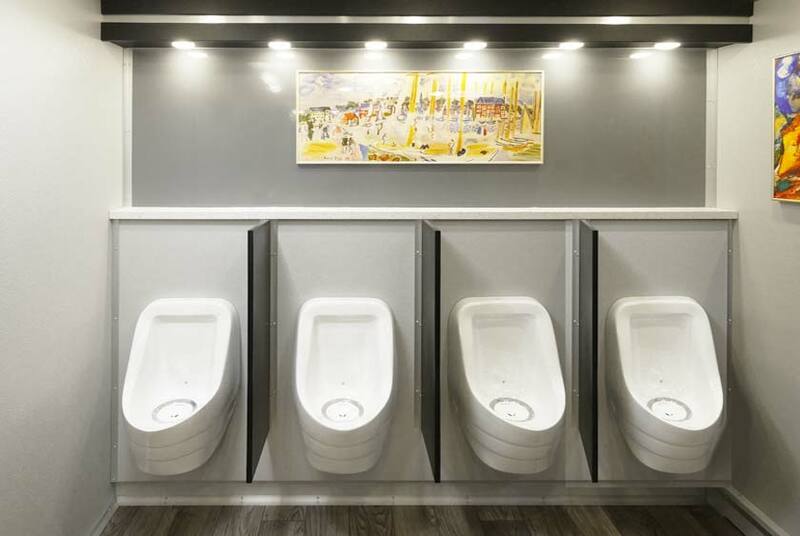 Above the urinals hangs an elegant framed art to match the restrooms sophisticated setting. 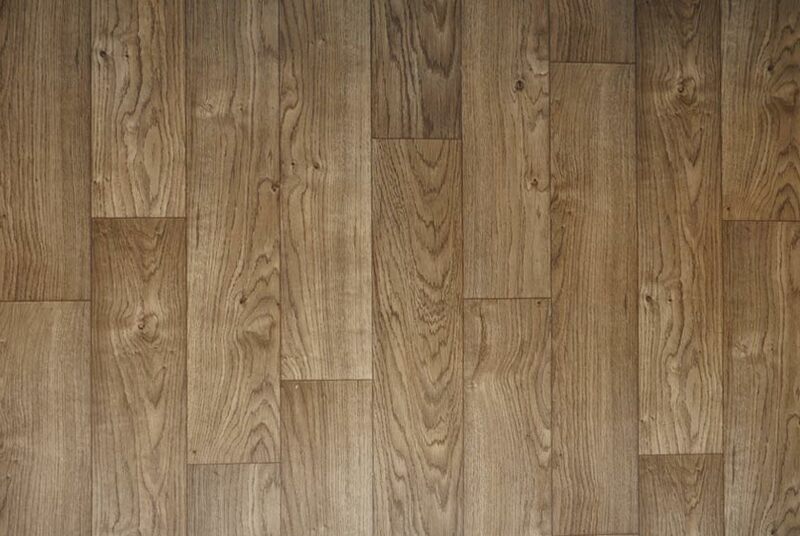 There is Armstrong wide planked wood laminate flooring which extends throughout both restroom facilities. 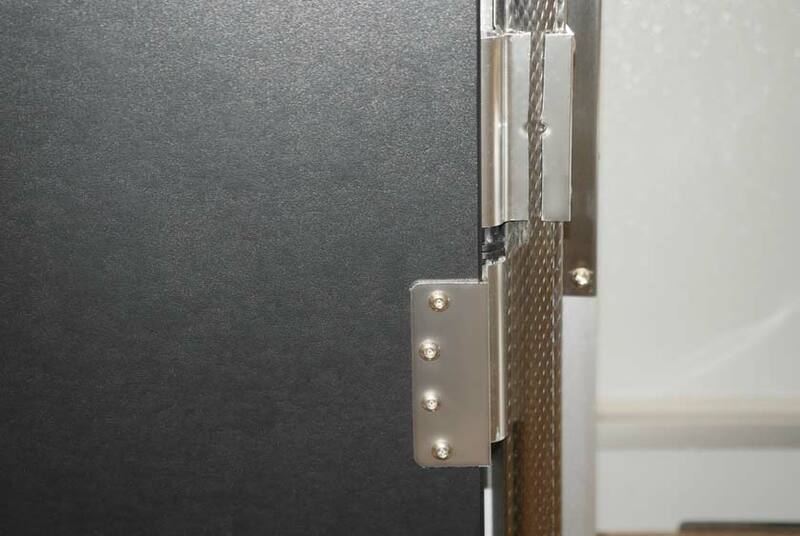 All of the artwork is custom framed in brushed nickel frames which was hand selected to add to the MODERN RESTROOM TRAILER's chic interior décor. 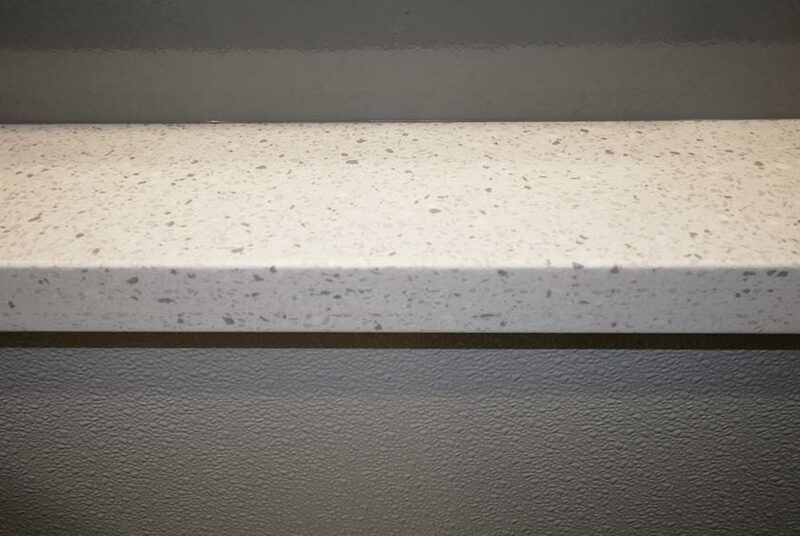 There are faux granite Corian vanity countertops with stainless steel sink basins. The stainless Chicago brand single lever faucets provides hot and cold running water. 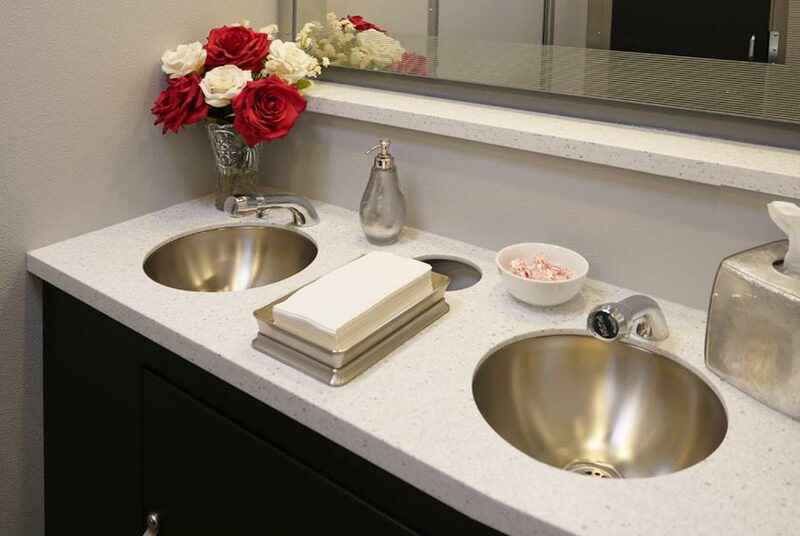 Elegant antibacterial soap dispensers, hand towels, filled tissue holder and candy dish are placed conveniently in the vanity area. 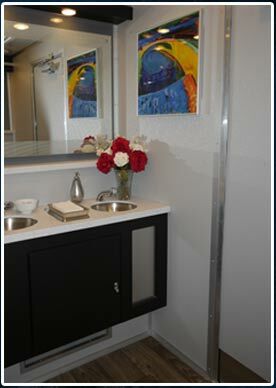 Custom designed floral arrangements bring beauty to the bathrooms setting. A full sized vanity mirror is provided above the sink with LED ceiling lighting that brightens the entire restroom. A built-in trash receptacle will keep the restroom and vanity area clean. Extra storage space is also available beneath the vanity sink for extra supplies. 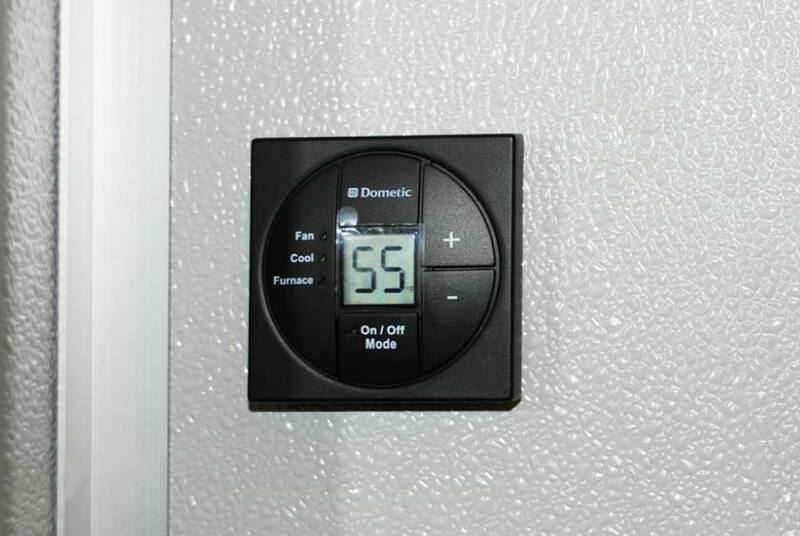 The MODERN luxury bathroom trailer has a Dometic duo thermostat heat and air conditioning system in addition to a wall mount fan forced heater to ensure of a comfortable restroom temperature any time of year. 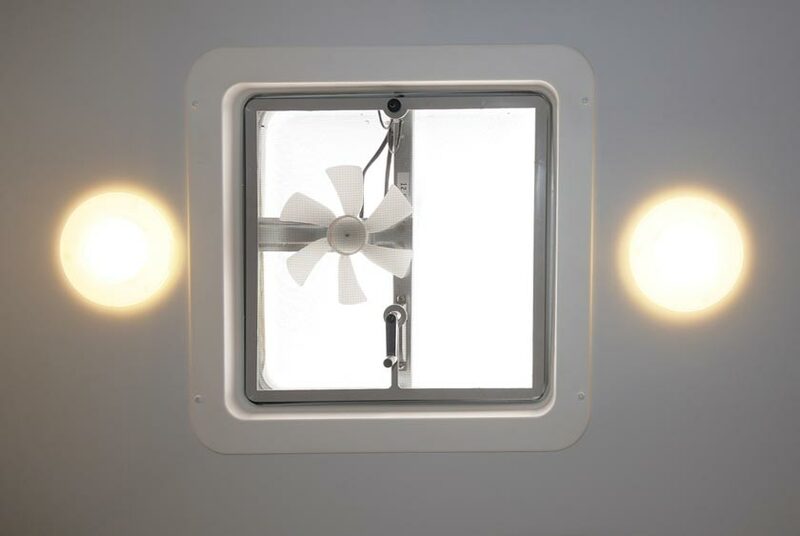 Another added feature, is both restrooms are equipped with a versitile skylight, fan, and ceiling vent for natural light and optional ventilation. Electricity conveniently runs from a generator or standard 110 volt outlet. 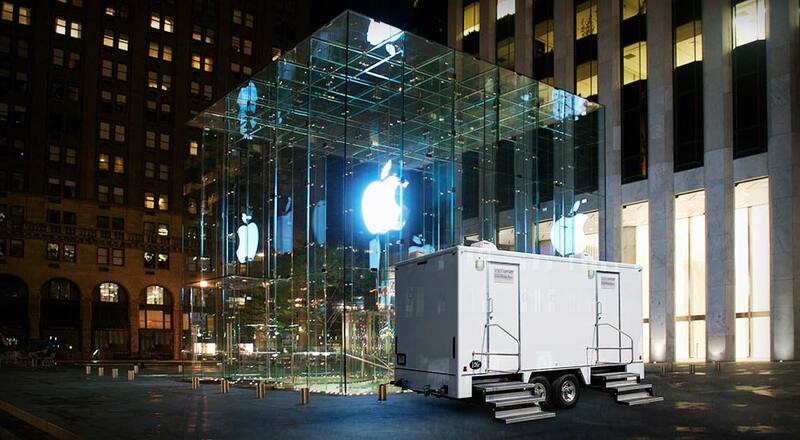 A CALLAHEAD professional uniformed delivery specialist will set up the MODERN RESTROOM TRAILER in approximately 30-minutes. CALLAHEAD cleans and sanitizes all of our equipment with only hospital grade cleaners and disinfectants for your sanitary protection. 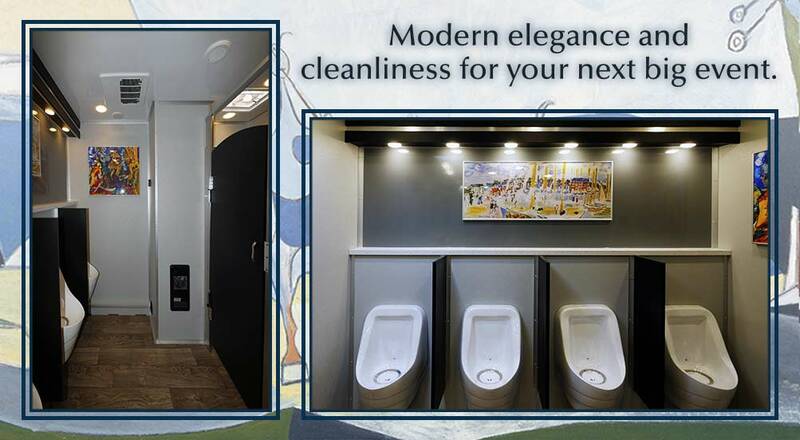 A professional uniformed restroom attendant is also available to keep the MODERN LUXURY RESTROOM TRAILER is like-new condition during your entire event. 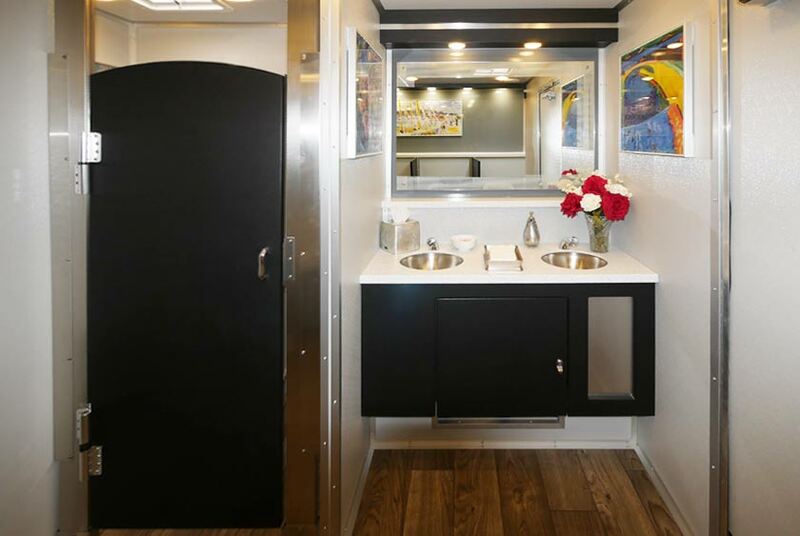 The MODERN restroom trailer's chic urban décor and VIP amenities delivers style and cleanliness guests will surely appreciate. 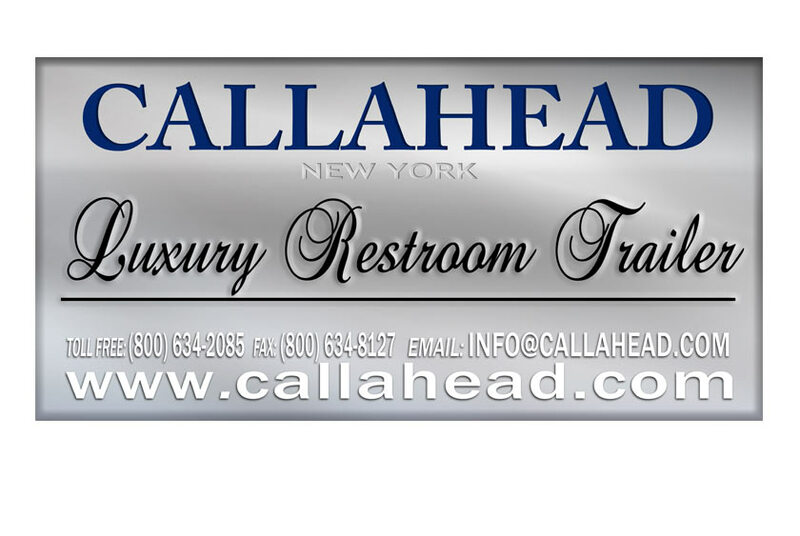 The CALLAHEAD brand promises to deliver a positive restroom experience to ensure bathroom facilities for your guests are something you won't need to worry about. 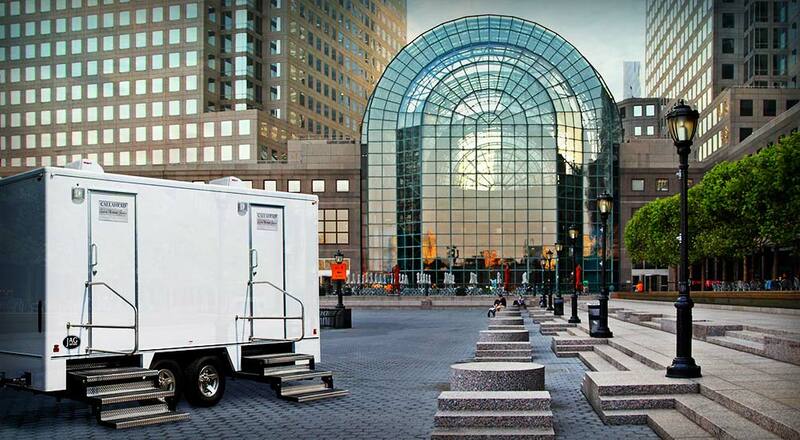 The MODERN LUXURY RESTROOM TRAILER is available for delivery throughout all of New York City's five boroughs of Brooklyn, Queens, Manhattan, Staten Island, and the Bronx as well as all of Westchester County, and Nassau and Suffolk Counties all the way to Montauk Point. 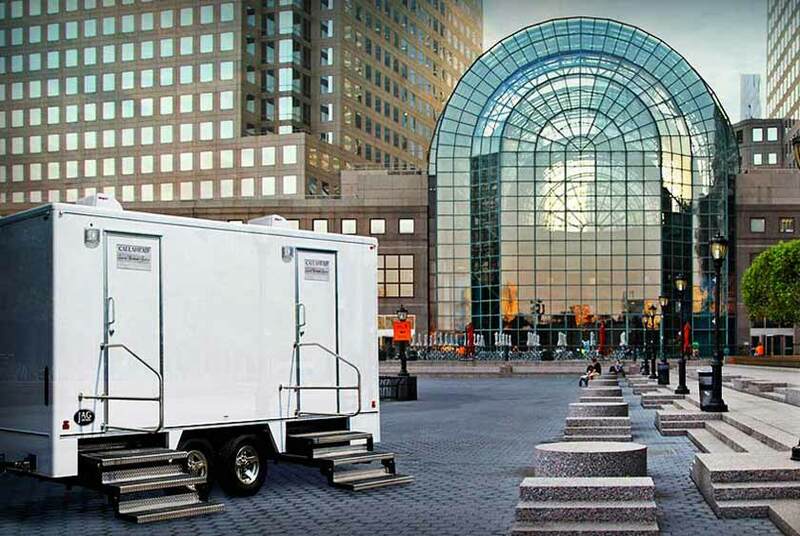 For more information about the MODERN LUXURY RESTROOM TRAILER or any of CALLAHEAD's innovative equipment, including VIP portable toilets, standard portable toilets, porcelain toilet systems for office trailers, security guard booths, holding tanks, fresh water delivery, commercial portable sinks, portable hand washing sinks, antibacterial and hand sanitizing dispensers, long-term or short-term portable toilet rentals, long-term or short-term restroom trailer rentals, portable shower rentals, and portable storage shed rentals, please contact one of our expert sales specialists at 800-634-2085 or visit our website for full photos, details and videos of our equipment for all your portable sanitation needs at www.callahead.com. 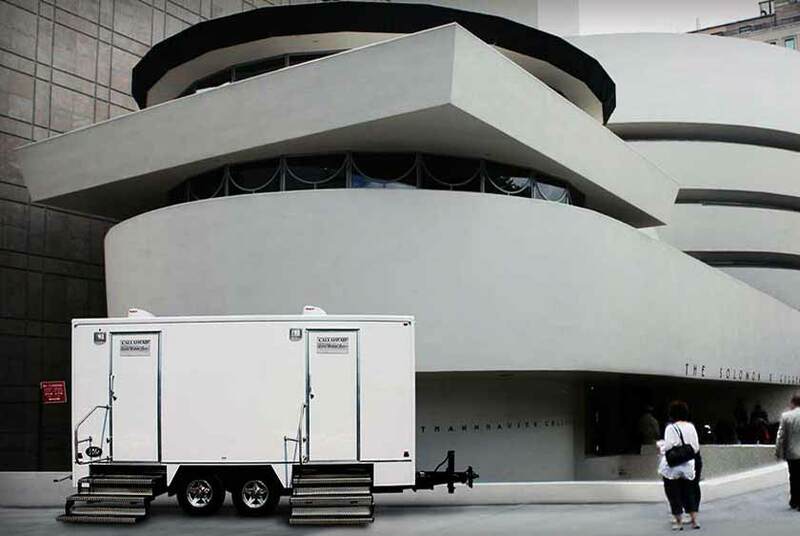 CALLAHEAD's MODERN LUXURY RESTROOM TRAILER is our 24-foot special event restroom guaranteed to deliver contemporary elegance and cleanliness for your family and friends at your next big event. 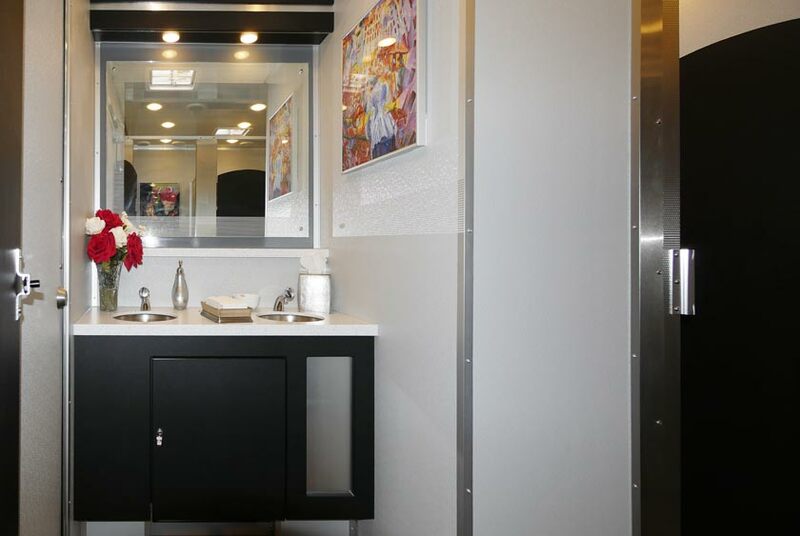 This restroom trailer's interior décor features a contemporary color scheme of greys and black with stainless accents throughout. A separate women's and men's restroom facility is something every guest will appreciate. 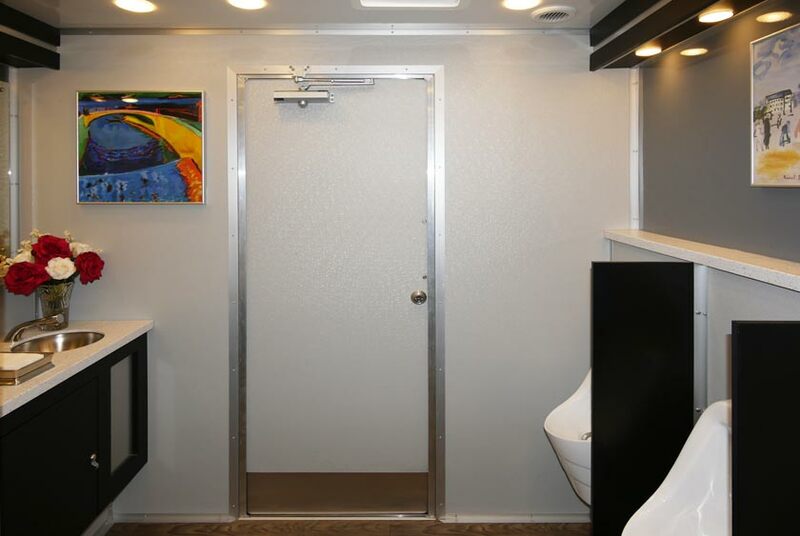 The MODERN RESTROOM TRAILER is the perfect bathroom rental for any large social gathering including corporate functions, galas, fundraisers, weddings or any social event. 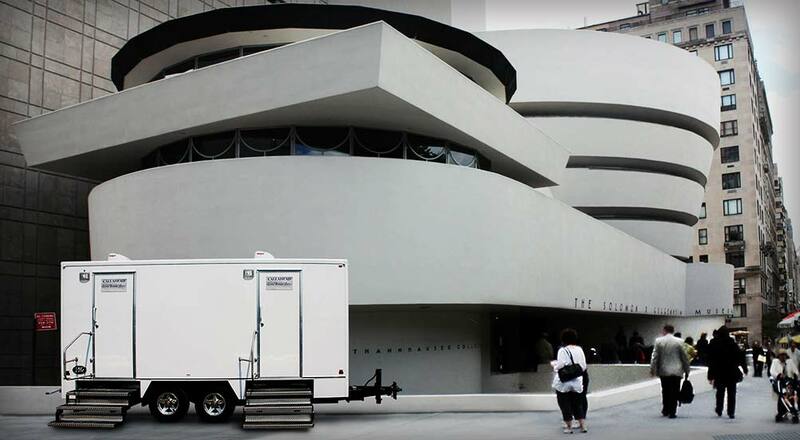 This extra-large 9-station special event restroom trailer will handle use by hundreds of people and includes all the VIP amenities with its rental. 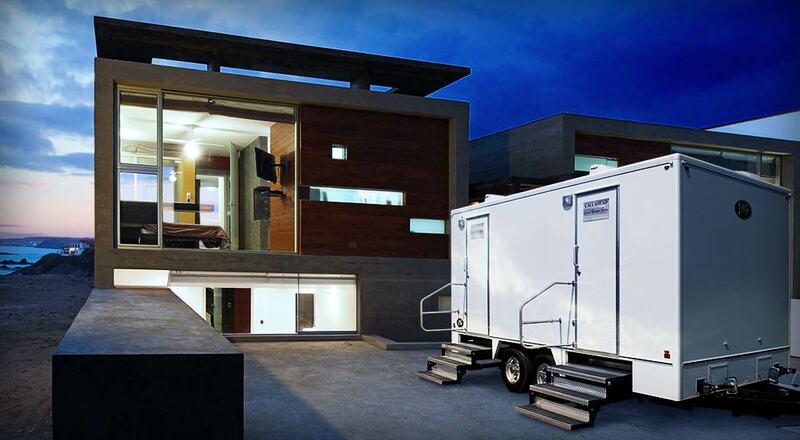 The MODERN LUXURY RESTROOM TRAILER has a bright white exterior with outdoor lighting. 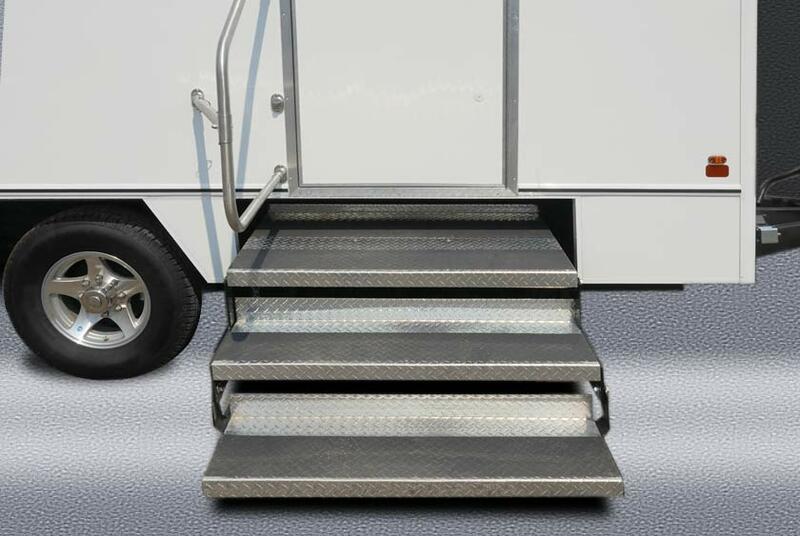 Guests enter the separate women's and men's restrooms via the trailers wide floating staircases with slip-proof surfaces and aluminum handrails. 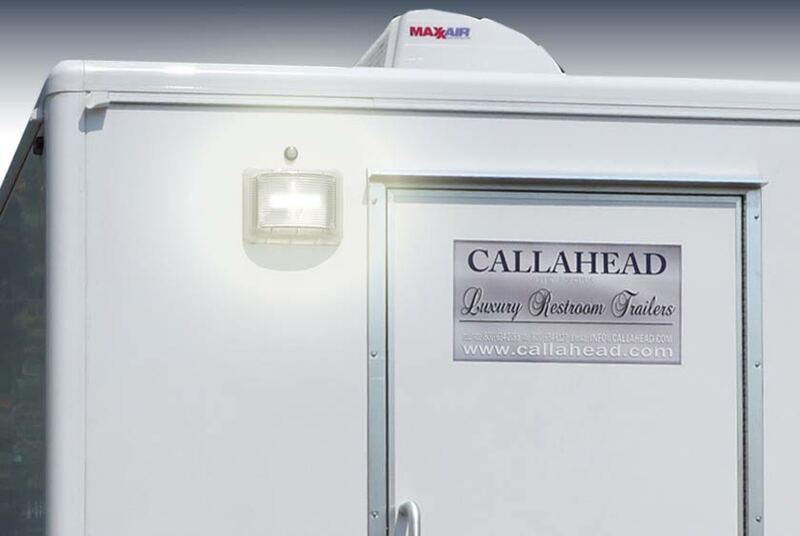 Both exterior doors display CALLAHEAD's signature signage informing your guests you have provided them with the best restroom trailers for their sanitary protectection, comfort and enjoyment. 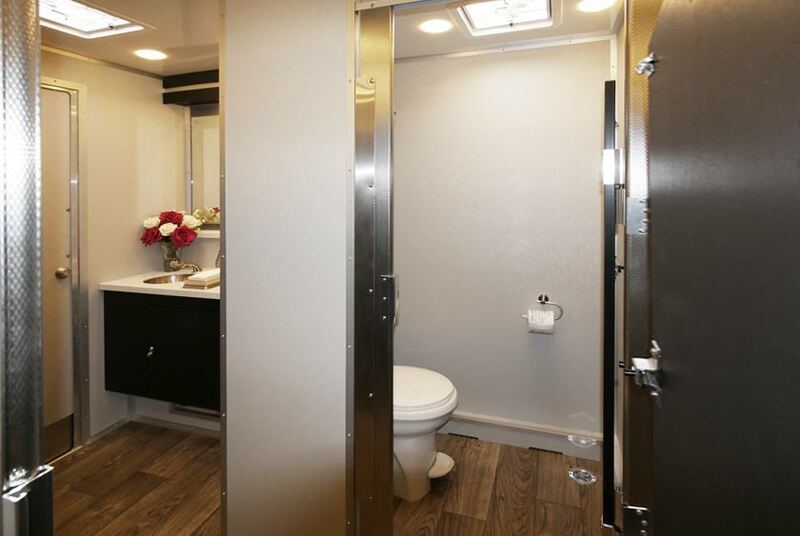 This RESTROOM TRAILER includes all the of the luxury features. 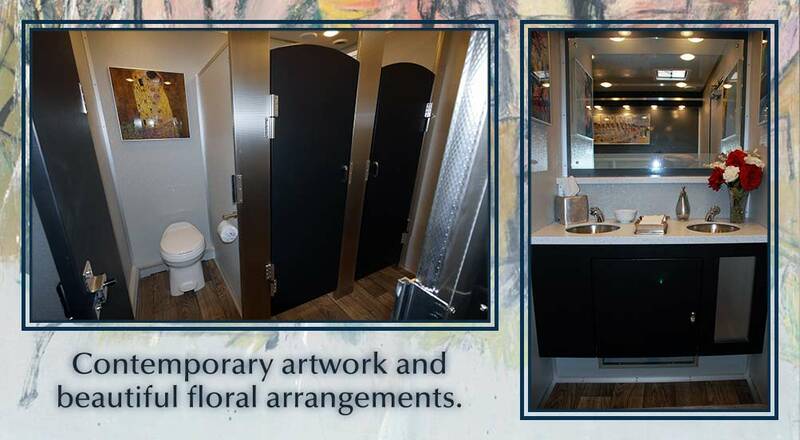 Each restroom has contemporary artwork in brushed silver frames and beautiful floral arrangements that were specially selected for the MODERN RESTROOM TRAILER. 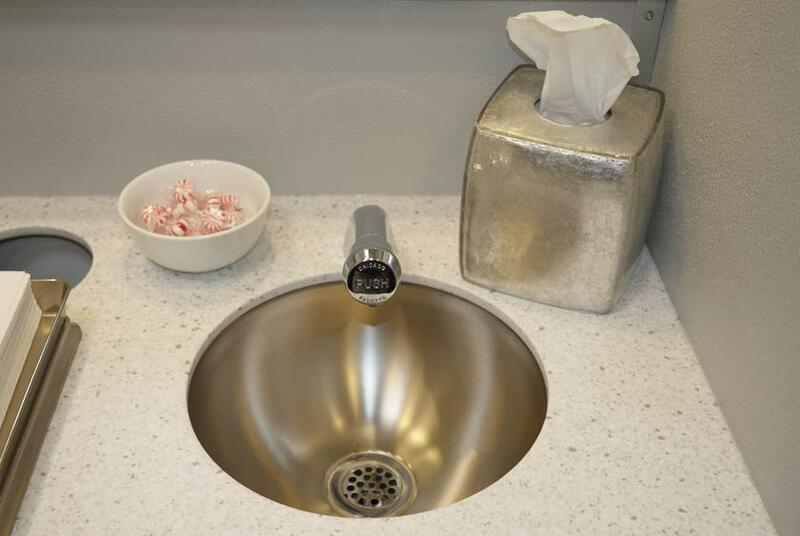 Also included are antibacterial soap dispensers, filled tissue holders, hand towels, and filled candy dishes for a five-star restroom experience. 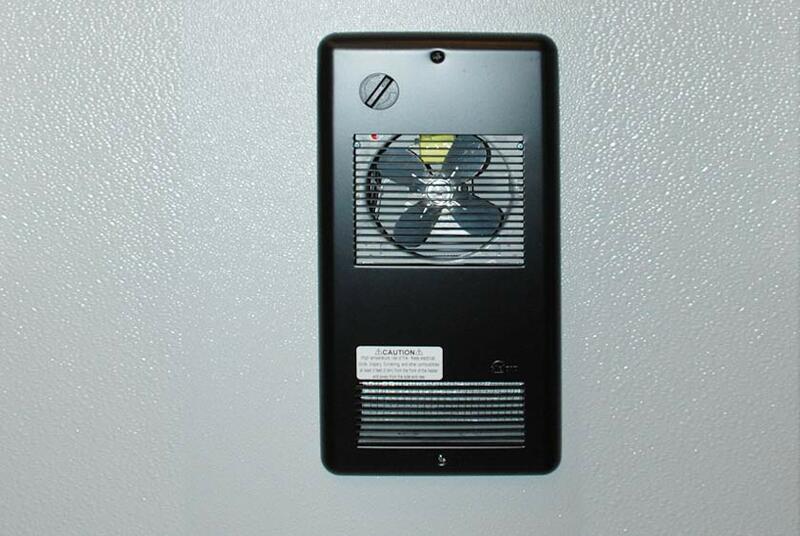 A thermostat heat and air conditioning system supplies comfort inside the restroom for use any time of year. 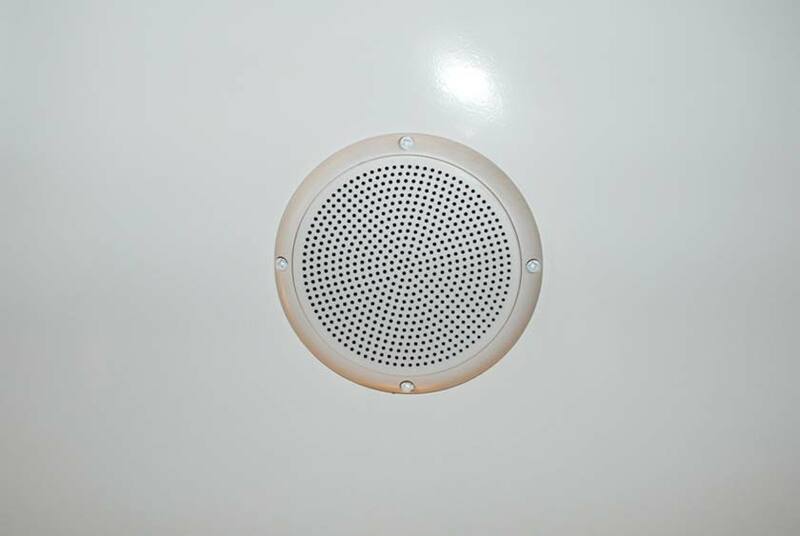 The surround sound music and speaker system delivers enjoyment to your guests throughout your entire event.